2015 National Conference Preview: Stephen Nichols and R.C. 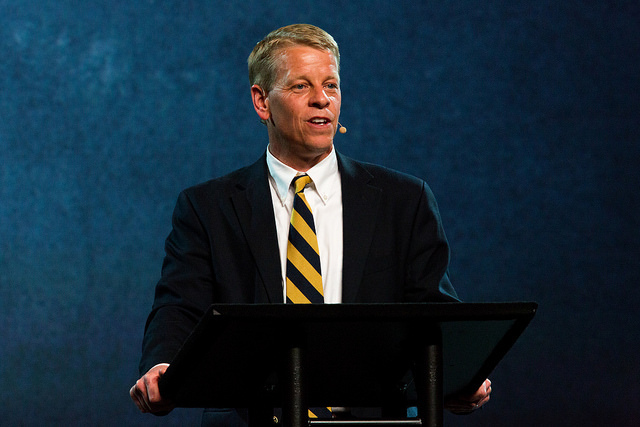 Sproul Jr.
Stephen J. Nichols is president of Reformation Bible College and chief academic officer for Ligonier Ministries. In addition, he is a teaching fellow for Ligonier. He was formerly research professor of Christianity and culture at Lancaster Bible College. A member of the Evangelical Theological Society, he chairs the society’s Jonathan Edwards Study Group and is the author of numerous books, including For Us and for Our Salvation: The Doctrine of Christ in the Early Church, Jonathan Edwards: A Guided Tour of His Life and Thought, Welcome to the Story, and Peace. Our culture is willing to voice respect for Jesus, but the Jesus it respects is not the God-man of Scripture. More often than not, the Jesus in view is just one among many saviors, a man who is nothing more than our brother and friend. In this session, Dr. Steve Nichols will remind us that although Jesus is indeed our brother and friend, He is also the King of kings and Lord of lords. Calling on God to restore us to a high view of the biblical Christ, Dr. Nichols will present the biblical view of Jesus’ love and majesty that we must lift up as the only light that can overcome the darkness around us. All of Dr. Nichols’ past conference messages can be found here. Below is his message titled, “Why the God Man?” from last year’s National Conference. In this message, he explained the incarnation, and also the one person and two natures of Christ. R.C. 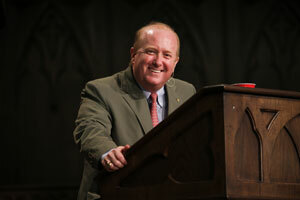 Sproul Jr. is rector and chair of philosophy and theology at Reformation Bible College. Dr. Sproul Jr. is also a teaching fellow for Ligonier Ministries and has authored several books and series, including Economics for Everybody, Believing God, Tearing Down Strongholds, Bound for Glory, and The Call to Wonder. He is also host of the podcast Jesus Changes Everything. Narcissism and egotism take our eyes off of the Lord and put them on us, but in so doing, they actually lower our understanding of ourselves, because we are made in the image of God. Without an understanding of God’s image in humanity—without a right focus on the Lord as our highest end—human beings are degraded, and all manner of destruction ensues. Dr. R.C. Sproul Jr. will explain how a right view of the self, enlightened by God’s Word, leads to blessedness, and he will direct us away from wrong views of ourselves to a right view—as creatures made in His image. You can find all of Dr. Sproul Jr.’s past conference messages here. Below is his message titled, “Christ and Him Ascended” from last year’s Fall Conference. In this message, he explains the significance of the ascension of Christ, explaining how Christ has been exalted. He explores what it means to confess that Christ is now putting all enemies under His feet. Please consider joining us for this conference next week. We hope to see you among the thousands who will gather in Orlando for teaching, worship, prayer, and fellowship. This is your final opportunity to register and save $20.